IT security vulnerabilities are a growing cause for concern for organizations trying to protect their data from printer breaches. Security breaches don’t only occur in mobile devices and computers, but can find their way into other endpoint devices – even your networked printer. 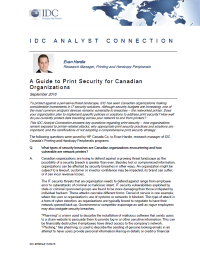 While investment in overall IT security is increasing, a printer security strategy does not tend to factor highly as a priority among Canadian organizations. Download this IDC Report to learn how organizations remain exposed to printer-related attacks, why appropriate print security practices and solutions are important, and the ramifications of not adopting a comprehensive print security strategy.